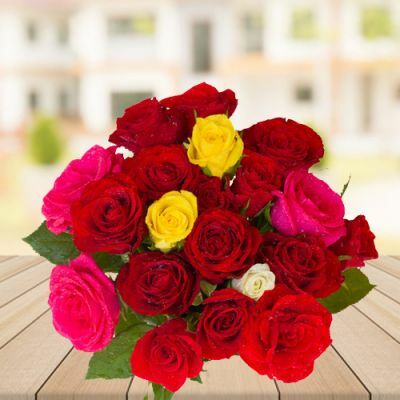 Send this 12 Multi colour roses bunch to your loved ones in India. Roses are the prettiest flowers on earth. They are not only beautiful but also intelligent as they understand the language of your heart and carefully carry your messages to the one you love. The 12 roses of different colors are blended together in an eye catching bouquet by our florist. The artistic mixing of colors is made prettier with the addition of green leaves. The 12 Multicolor Roses make an excellent gift, send roses bouquet on wedding, birthday, anniversary or any other happy occasion. Do not wait for an occasion, send flowers any day to make someone feel sweet and special. Home delivery, same day delivery and midnight delivery service is available.